Should social media platforms allow anti-brand / negative advertising? There was a very interesting happening in the social media space recently, when a customer put out a promoted tweet, to sound out his frustrations against British Airways. Perhaps the first instance of this kind, this was a topic of a lot of discussions, including this interesting debate that happened on my own timeline. In fact, there was more deliberation on the subject, as Karthik Srinivasan did a blog post on the subject, cuing it with the above-referred discussion on my timeline to begin with, and sharing his details point of view on the subject. More opinions were expressed as Karthik shared the post on Facebook and Twitter. So, as always, Karthik does a good and thorough job of putting together facts and his viewpoints on the subject, and I fully respect the same. I agree with most of the points he makes in his blog post. Why do I still see the need to make some additional comments here? That is simply because, I believe, the point that I was trying to make, via my FB post, and the conversation that I had, mostly with Paul, on my timeline as referred above, was slightly different. And which I want to bring out and highlight hereunder. 1. I am definitely of the opinion that the power shift has happened into the hands of the consumer, with the advent of social media. And I am all for it. I talk about this to my clients, almost everyday, and also at speaking events, often. Personally, I have had a few occasions when I have had to take my battles with certain brands on to the social media spaces, after having tried all other traditional means, and not managed to make any impact on the brand. So I recognise the need and the relevance of consumers using social media channels to put out their perspectives about brands, especially the negative ones. This is happening, will happen more, and I have no issues with this trend. 2. I also do NOT believe that social media platforms would prevent some kind of content about a brand coming on to their platforms, because that brand is also an advertiser, and they would fear that the advertising revenue will be lost. No, I don’t believe that would be a motivation for the social media platforms to stop a piece of content coming up on their platforms. If these are not the issues, then what else are the points that I was making, when I had some concerns about the trend of consumers putting out anti-brand / negative content, via paid digital advertising methods? Why do they even want to put some restrictions of this kind, if they have no liability towards the advertising content? Why do platforms have a process of “reviewing” the ad content, at all?? I believe they DO have some level of liability, even if it may be a grey area of sorts, and due to which reason they would want to not let things go totally out of hand. 2. So do I believe that a genuine customer, making a genuine case about a brand, can take things ‘out of hand’?? No, certainly not. 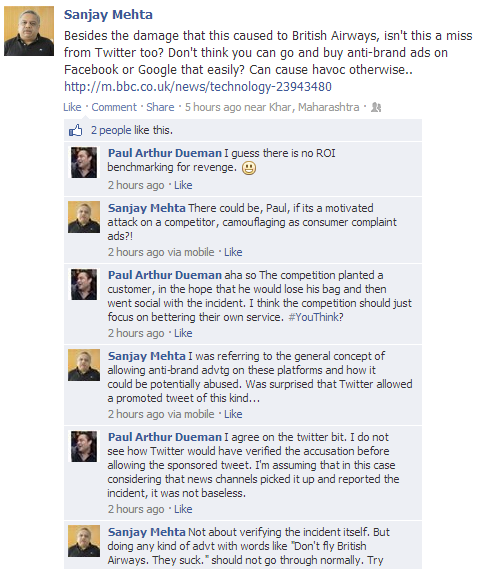 My point was in regards to potential abuse of the system, due to allowing such anti-brand advertising. Few days back there was this rumour floating around, about how Delhi police had issued a warning to not consumer Frooti, as it caused AIDS!! Obviously a hoax, but an extremely damaging one for the brand. The company had to take very strong action, as you can see here. This hoax could have been someone’s mischief. It could have been motivated by a unscrupulous competitor. The spread of a rumour of this kind, in a country like ours, could seriously knock off market share of Frooti?! And which would be hard to recover back. A prankster who does it for fun, and puts out a blog post or a post on his Facebook page, or a review on some customer review site, will generate x amount of reach. Bad enough for Frooti, but not AS damaging as it could get, if one actually put out paid ads on various platforms propounding such misinformation! AND if there was a competitor’s hand at the back, and where crores of rupees of market share is involved, does it stop the unscrupulous competitor putting out several lakhs of rupees, to have this come out as an ad, and put out in the name of a consumer?! The damage caused by an activity of this kind can end up causing substantial damage to Frooti, before it is picked up, and recovery efforts are put in place. And to think that, it would be so easy to achieve something like that? Today, Frooti, tomorrow Nescafe or Cadburys or whoever. And if a few thousand crores of “loss” happens, does the brand have ANY hope to sue that fronting consumer, and expect to recover even a fraction of that amount? 3. The question then could be, that if damage had to happen, it can happen with organic content also, and not just with paid content. So if we cannot stop organic content (a user’s FB post / her tweet / her blog post / her posting on a customer review site, for example), how and why should platforms stop the paid type? Yes, there’s clearly a thin line here. My view is only motivated from the fact that these platforms HAVE some process of guidelines for advertising, for ad reviews, etc. So there is an element perhaps, of an involved liability, which will force them to not accept rank potentially derogatory advertising, from anyone. If Twitter does not have guidelines of this kind, maybe they will also create some. In the absence of guidelines and in the absence of scrutiny of ad content, things could get chaotic out there?! We have fought a fierce battle for one of our clients, where as a market leader, they were attacked by one of their upstart competitors, by relentless, fake accounts based complaints lodging, on various consumer review platforms. It took a massive effort to quell them down, and clean up the space. I shudder to think the level of damage that paid advertising of anti-brand reports could have caused then..?! 4. So am I sounding very soft and sympathetic towards brands, in my stand here? No, even though I earn my bread and butter from working for brands, on social media, this post is not to bring sympathy for brands. They do have enough money, many do enough wrong, and when necessary, we need to go after them, and expose their failures. My concern is about the playing field becoming one mega chaos where then, you cannot distinguish fact from make-believe. Let’s visualise a scenario, especially after seeing this promoted tweet case of the customer, against British Airways. That say, every grieved customer who has a few thousand rupees to spare, goes out and creates such promoted tweets or promoted posts, or Facebook advertising. Add to that, a certain breed of agencies (of the kind that buys you millions of fans from anywhere in the world, or who black-hats your SEO.. you get the drift, right, about the kind of agency I am referring to?!) who will start offering to companies, a route to ‘bring down their competitors’ for a few lakhs of rupees. So we see a huge surge of similar anti-brand advertising emerging from such agencies (with a front name of a consumer…). Are these difficult to imagine? Not to me at least. What would this result in? Mayhem on the advertising platforms, and consequently, disaster for the brands.. ?! Yes, it could generate more moneys spent on digital advertising (or “anti-advertising” to be more precise), and due to the damage caused, more money spent on ORM. But would it be healthy?? Would the platforms and the media itself lose credibility as a consequence?? THAT is my fear. Once opened up, can the tap be shut? I doubt it.. If you will go back to my Facebook timeline and my discussion with Paul, the specific concern that I raised there, and which I have elaborated here, IS about misuse and not about genuine use, by genuine customers! Hope I have made my point of view a little more clear, at least, now.. Valid points! I can very well imagine how anti-brand advertising emerges from competitors (like competitors reported Facebook pages against FB’s TOS for example) and I agree there is a thin line between getting out frustrations in organic content vs. paid content. I hope to see Twitter establishing some rules for ads. Both sides are valid. But as a brand owner and customer I see a basic difference here 1) The customer takes to the social media without approaching the redressal system/process – yes it has known to happen, more so in the Indian context. How can a platform prevent that? 2) Brands that have a presence on social media BUT rarely respond to customers, forcing customers to seek different or unique recourse such as the BA episode. How can a platform prevent/help overcome that? This happens in the main stream media also via Advtg/PR/paid media and eventually the reader/viewer decides. The same thing is eventually and likely to happen on this medium also. In the meantime, it will be a great learning for the brands, agencies and customers. I read the entire episode on Kartik’s blog and yours. Even my first reaction on reading the news was that how could Twitter allow such paid ads. It was indeed difficult for me to comprehend. I agree that there should be a proper mechanism on each platform to ensure that demeaning ads are not circulated on the platform. But, as @anaggh said, there are sometimes when brands simply do not solve the customer’s problem and customer is forced to take social media route. Even I am a dissatisfied customer of Airtel and inspite of numerous requests they never solve my problem. The only lame excuse they give is “we will figure out and get back to you”, which they never do.